“We are trying to keep these classic stories, and classic characters, in kids’ minds,” said Nancy Kanter, executive vice president of original programming and general manager of Disney Junior Worldwide. "With school systems placing more emphasis on math, science and analysis of documents, perhaps there’s less room for Tom Thumb and Hansel and Gretel? “We thought it was really important that kids still had a touchstone to these time-honored tales,” she added. I can't tell you how encouraging it is to hear that. While I believe there's more to it than just "wouldn't it be nice to keep some of that heritage alive", it's a wonderful start. I vote thumbs up! They're also kicking this off via the vehicle kids are using most these days: apps, online access and games. While series TV via Disney Channel and Disney Junior on cable (and possibly other providers) will follow in November, the idea is to get the series into the hands of kids where they're most likely to find it for themselves first. 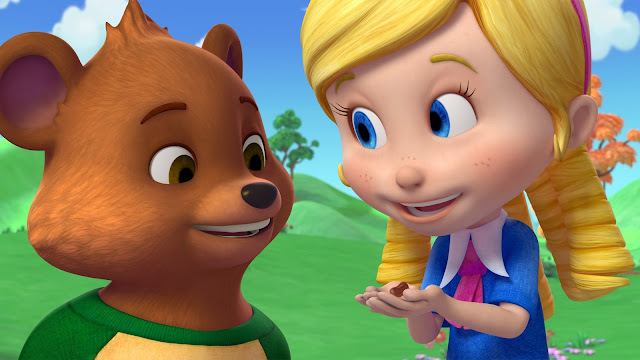 Disney Junior will debut the first six episodes of fairytale-inspired "Goldie & Bear" on the popular WATCH Disney Junior platforms, beginning Saturday, September 12, with one new episode premiering on the WATCH Disney Junior app and WATCH Disney Junior.com each Monday from September 21 through October 12. Set in the magical world of Fairy Tale Forest, the animated series for kids age 2-7 reunites Goldie and Bear, after the renowned porridge incident featured in "Goldilocks and The Three Bears." 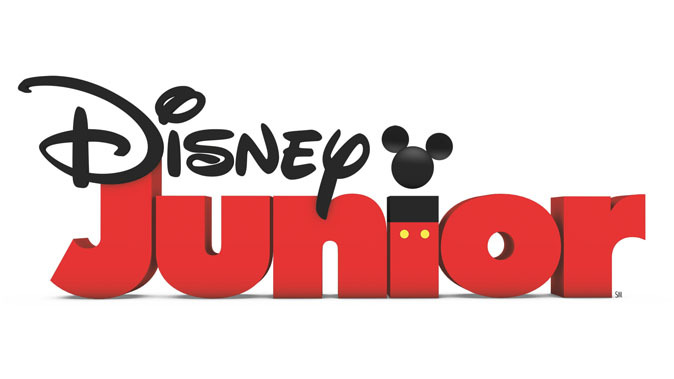 The series premieres in November on Disney Channel and Disney Junior. Reflecting Disney's deep roots in storytelling that resonates across generations, "Goldie & Bear" captures the timeless appeal of sharing stories through fairy tales, folk tales and nursery rhymes. Each episode features two 11-minute stories that showcase the new, unexpected friendship between Goldie and Bear as they seek out fun and adventure along with their friends and neighbors, all of whom are drawn from beloved storybook characters. Whether it's helping the Big Bad Wolf learn to consider others before blowing down their houses, helping Jack and Jill get up that hill, or rescuing accident-prone Humpty Dumpty after his great fall, Goldie and Bear enjoy living in a fairytale world filled with real-life situations, humorous mishaps and heartfelt moments. Beginning where the classic tales leave off, "Goldie & Bear" celebrates the distinct personalities of Goldie, Bear and their quirky pals, and encourages children to develop their own enchanting friendships. The series is populated with a diverse cast of storybook characters who model friendship, community, respect for individuality, resilience in the face of adversity and compassion for others, and is meant to spark conversations among kids and parents about the narratives and morals highlighted by Goldie and Bear's unlikely friendship and their comedic interactions in Fairy Tale Forest. Maria Tatar, chair of Harvard University's program in Folklore and Mythology and series consultant, advising on storytelling, fairy tales and folklore, said, "When we are stumped, a story often provides the answer - not in the form of a one-liner but in a conversation about the things that mattered to us in the tale." 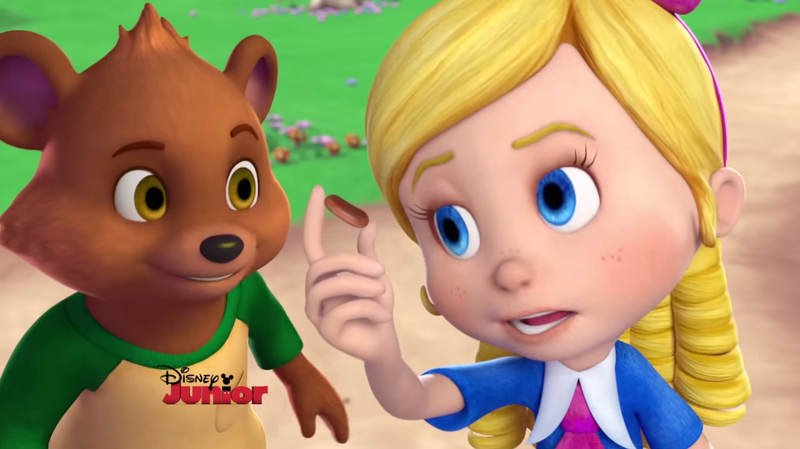 DisneyJunior.com and WATCH Disney Junior will roll out a suite of more than 20 "Goldie & Bear" micro-games throughout the fall, with the first six debuting with the series. Housed in a storybook containing an interactive map of Fairy Tale Forest, each game centers on a classic fairy tale or nursery rhyme character. "Goldie & Bear" stars Natalie Lander ("The Middle") as Goldie and Georgie Kidder ("Star Wars: The Clone Wars") as Bear. Recurring guest stars include Lesley Nicol ("Downton Abbey") as Fairy Godmother, Isabella Day ("Cristela") as little witch Rosita, Debby Ryan ("Jessie") as Thumbelina and Miles Brown and Marsai Martin ("black-ish") as Jack & Jill. "Goldie & Bear" was developed for television and is co-executive produced by Jorge Aguirre ("Giants Beware!" 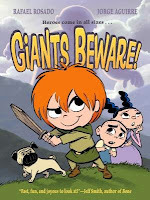 graphic novel series); Chris Gilligan ("Frankenweenie") is executive producer and director; Joe Ansolabehere ("Recess") is story editor and Rob Cantor (from the band Tally Hall) is songwriter. The premiere episode "Big Bear/Birthday Chair" will go live on the WATCH Disney Junior app and WATCH Disney Junior.com on Saturday September 12th. 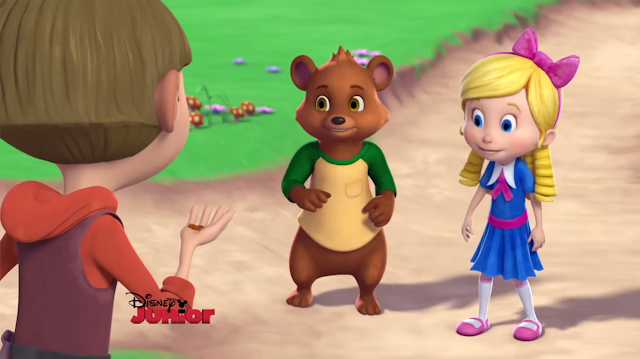 In the episode, when Bear eats one of Jack’s magic beans so he can be a bigger bear, he and Goldie must find a way to reverse the magic after he learns being big isn’t as fun as he thought. Then, when Goldie forgets Bear’s birthday gift, she has to quickly find the most perfect present for her best friend. Normally I might make a note just to check in with a series like this (like I did for The 7D) but with Maria Tatar consulting on the series since it's early development, and continuing on with the show in this capacity, I'm going to make a point of watching it when I can. It should also be noted that, Jorge Aguirre, creator of the wonderful graphic novel series Giants Beware, developed this series and is co-executive producer as well, so they're all points in favor of the series as far as I'm concerned. I'm always a little hesitant to jump on board with CG series as many of them look so similar they can begin to blend together but perhaps a unique signature style will become more obvious and the show will look more instantly appealing when we see more variety of situations and characters. Even with my reservations about the design style, the acting, animation and writing glimpses we have been given look very promising. 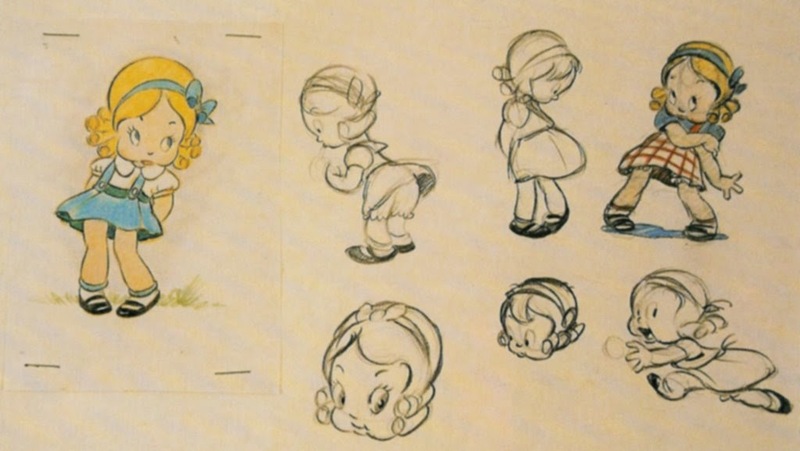 The Three Bears (or Goldie Locks and Three Bears) is an unproduced animated short that was to have been released in 1936. It is a proposed Silly Symphony of the well-known children's story. Model sheets prove that Goldilockswas planned to look like, and possibly be voiced by, Shirley Temple. Papa Bear was modeled after W.C. Fields. Another version of this short as a Mickey, Donaldand Goofy cartoon would have had Mickey, Donald and Goofy casted in the roles of the Three Bears which was approached to the story after the prosed Silly Symphony failed to materialize.